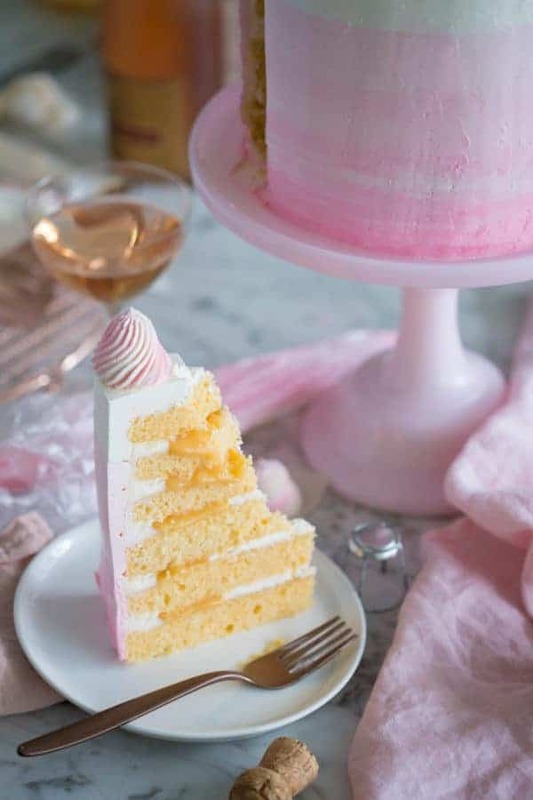 This zingy pink champagne grapefruit cake is filled with an effervescent champagne grapefruit curd and covered in a creamy Italian buttercream with a pink ombré effect, swirled with dollops on top. Did I mention how good this grapefruit champagne curd is? Pink champagne is made either by adding some pinot noir to champagne or by allowing the color to develop from letting the juice mix with the dark grape skins for a time. This later method is known as the saignée method. This is what your smoothing tool will look like after swiping the side of the cake. SO PRETTY, but it goes into a piping bag and used for the dollops! For the cake pictured I doubled the recipe and made six 8″ layers. That’s double the cake batter, double the grapefruit curd, double the grapefruit buttercream but not double the Italian buttercream. I had JUST enough of that. If you make a taller cake I suggest chilling it once you’re 3 layers up so the whole thing doesn’t collapse! Let me know if you have any questions! If cake seems unstable then add a skewer through the middle and chill in fridge until set. If things are really bad then add a collar of parchment paper and secure with tape or twine to hold the cake together, chill until set. 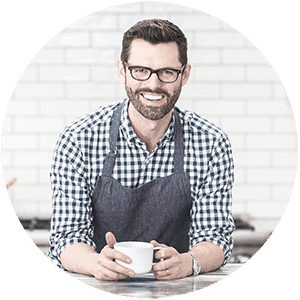 You can make the curd a few days ahead and keep in the fridge in a sealed container until ready to use. I piped my dollops onto a small piece of parchment paper then froze them and placed on by the finished cake. I do this for swirled dollops so I can have more control and discard the one’s I don’t like easily. You can TOTALLY pipe them directly onto the cake though. 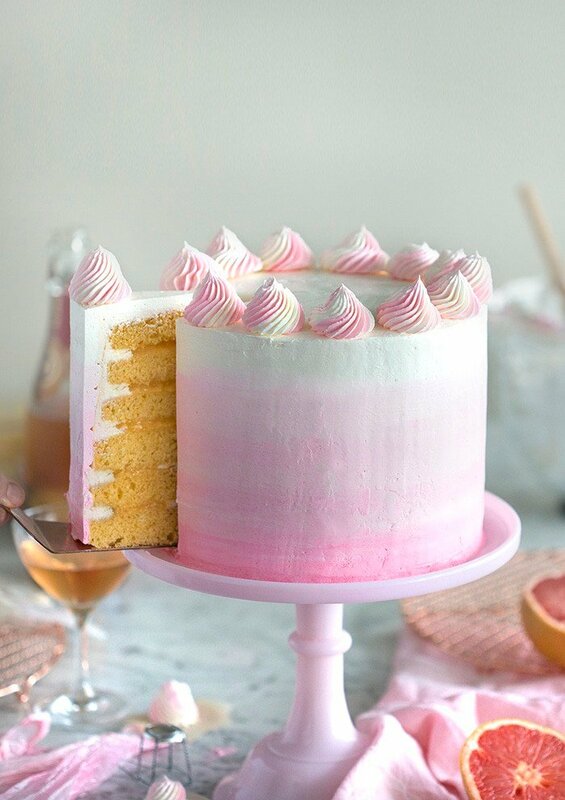 How do You Make Pink Cake Mix? The easiest way to make any light colored cake mix pink is to add some soft pink gel food coloring to the wet mixture. Add a very small amount at a time but make the color just a bit more saturated than you want as it will lighten up when the dry mixture is added. How do You Make a Champagne Cake? 1. For the Cake: Preheat the oven to 350°F. Butter and flour 4 six inch cake pans. Sift together the flour, baking powder, and salt. ** I went crazy and made a GIANT batch of batter for 6 eight inch layers for the photos in this post. 2. Cream together the butter, sour cream, and grapefruit zest. Slowly add the sugar, mixing until the mixture is light and fluffy. Scrape down the sides of the bowl. 3. Add the eggs, one at a time, mixing well between additions and scraping down the sides. Add the sifted dry ingredients alternately with the grapefruit juice to the creamed mixture, beating well on low speed after each addition. Pour equal amounts of the batter into the four prepared cake pans. (I also use cake strips on my pans for more even baking.) Bake until a toothpick inserted in the middle comes out clean, about 22 min. Cool the cake layers in the pans for 10 min. Transfer layers from pans to cooling rack and set aside. 4. For the Italian Buttercream: Beat the egg whites, salt, cream or tartar and 1/3 cup of sugar until soft peaks form. In a medium saucepan add the remaining sugar and 1/3 cup water then place on low heat. Maintain at medium high heat until temperature reads 240F. Drizzle the sugar into the mixer immediately. 5. Run mixer until meringue is body temperature. Add room temperature butter into running mixer one piece at a time. Beat until butter is combined and mixture has reached a silky consistency. 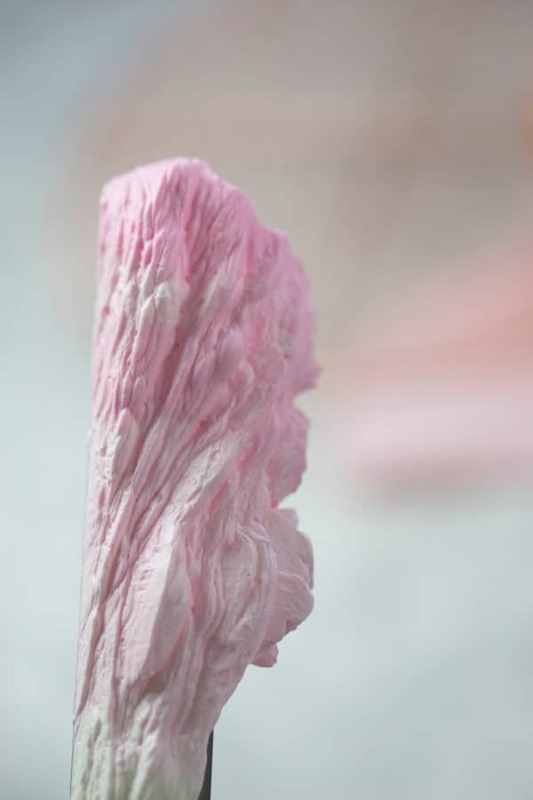 Divide buttercream into about 5 batches and create a ping gradient by adding various amounts of soft pink food coloring. 6. For the Grapefruit Curd: Whisk together sugar and the flour in a heavy-based saucepan. Add the grapefruit juice and egg yolks and whisk to combine. Put the saucepan over medium-high heat and cook, whisking constantly until the mixture boils. Cook while stirring constantly, the mixture will become thicker and clearer. Whisk in the champagne and allow mixture to bubble for 1 minute. Remove from the heat and stir in the butter. Transfer to a bowl, cover surface with plastic wrap and chill. 7. For the Crumb coat Buttercream: Beat butter until light and fluffy. Add sugar in several batches and beat until well combined. Add in the grapefruit juice and champagne a tablespoon at a time until desired consistency is reached. Pipe a ring of the buttercream onto the first cake layer, add a large dot of buttercream in the center. This will hold the curd in and help support the cake. 8. 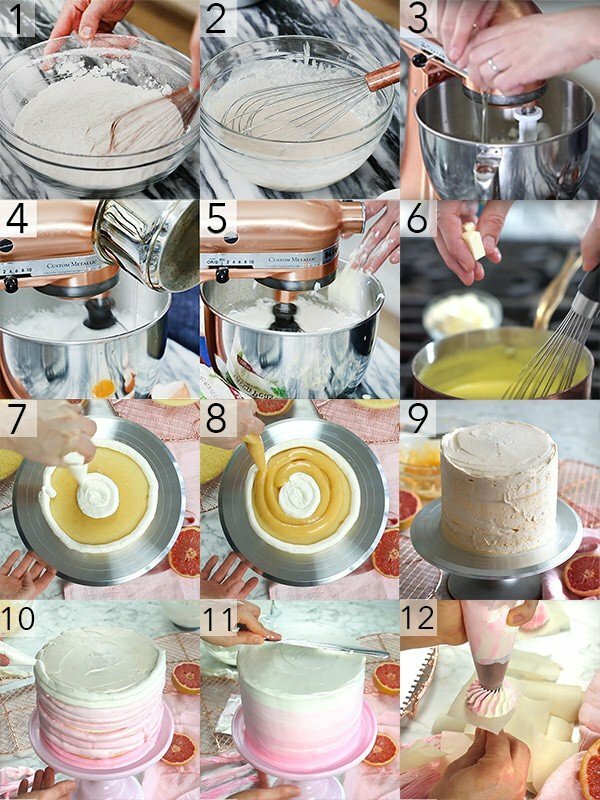 Pipe or spoon the chilled curd onto the cake layer and repeat steps 7 and 8 until the cake is built up. If cake seems unstable then add a skewer through the middle and chill in fridge until set. 9. Add a thin layer of buttercream to the cake, give it a rough smooth and chill in the fridge for 15-20 minutes to set. 10. Pipe the Italian meringue buttercream onto your crumb coated cake starting with darkest pink and ending with the uncolored batch. 11. Smooth side with a bench scraper and top with an offset spatula. Fill in any gaps on the side before giving a final smooth. 12. I used an 869 tip to pipe the dollops, froze them, and then placed them on top. Just fill the piping bag with leftover pink and white buttercream so you can have nice multicolored stripes. 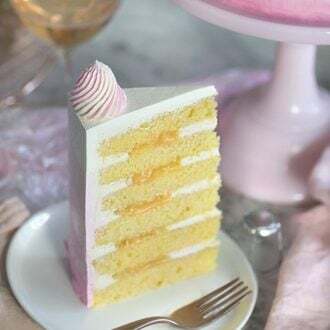 If you’ve tried this champagne cake then don’t forget to rate the recipe and let me know how you got on in the comments below, I love hearing from you! Champagne and fresh grapefruit juice combine to make this a very special cake. Whisk together sugar, cornstarch, and the flour in a heavy-based saucepan. Add the grapefruit juice and egg yolks and whisk to combine. Whisk in the champagne and allow mixture to boil for 1 minute. Cream together the butter, sour cream, and grapefruit zest. Add the sifted dry ingredients alternately with the grapefruit juice to the creamed mixture, beating well on low speed after each addition. Pour equal amounts of the batter into the four prepared cake pans. (I also use cake strips on my pans for more even baking.) Bake until a toothpick inserted in the middle comes out clean, about 22 min. Cool the cake layers in the pans for 10 min. and then loosen the layers by running a knife between the cake and the edge of the pan. Remove the layers from the pans and put them on a rack to continue cooling. Beat butter until light and fluffy. Add sugar in several batches and beat until well combined. Add in the grapefruit juice and champagne a tablespoon at a time until desired consistency is reached. Beat the egg whites, salt, cream or tartar and 1/3 cup of sugar until soft peaks form. Maintain at medium high heat until temperature reads 240F. Run mixer until meringue is body temperature. Add room temperature butter into running mixer one piece at a time. I used an 869 tip to pipe the dollops, froze them, and then placed them on top. I piped my dollops onto a small piece of parchment paper then froze them and placed on by the finished cake. I do this for swirled dollops so I can have more control and discard the one's I don't like easily. You can TOTALLY pipe them directly onto the cake though. Hi.. I would like to know what kind of sugar do you used in the filling and the cake!! And why you didn’t put the dollops directly on the cake !! The curd used granulated white sugar. I piped teh dollops on separately and chilled them so I could get a nice swirl and not worry about messing up, totaly optional! Can I use cane sugar instead of granulated sugar? Is there a difference for baking? Thank you!!! Is the Italian buttercream flavored at all? This cake looks incredible. I wanted to make it for a friend’s birthday party but she doesn’t like grapefruit that much. Have you got any suggestion for something i could use instead of grapefruit? You could use raspberry juice instead!